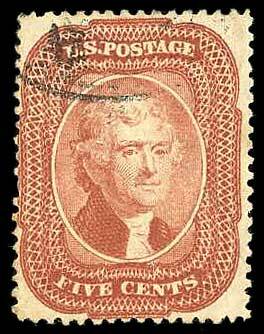 United States, 1856, 5¢ Red Brown, #12, light cancel, 4 ample margins, Very Fine. 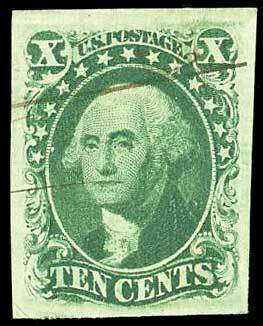 United States, 1855, 10¢ Green, Type II, Strip of 3, #14, clear margins except upper right, San Francisco cds, short tear at top between left pair, two tone spots on right copy, otherwise Fine to Very Fine. United States, 1855, 10¢ Green, Type III, #15, manuscript cancel, 4 full margins, a lovely example, Very Fine to Extremely Fine. 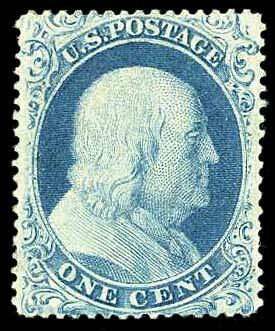 United States, 1861, 1¢ Blue, Type I, #18, "Small part disturbed o.g. with a short perf at lower right", otherwise Fine to Very Fine, 2016 P.S.A.G. cert. 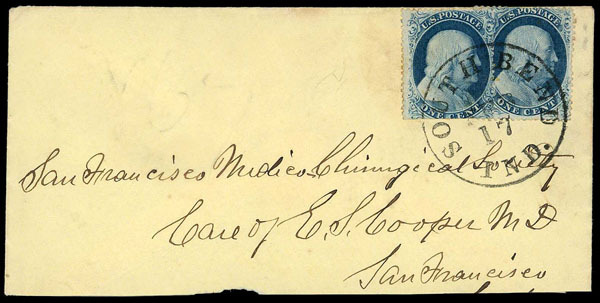 United States, 1861, 1¢ Blue, Type I on Cover, #18, 26, sound, tied with #26 from Boston to Ohio, very clean cover, Fine. 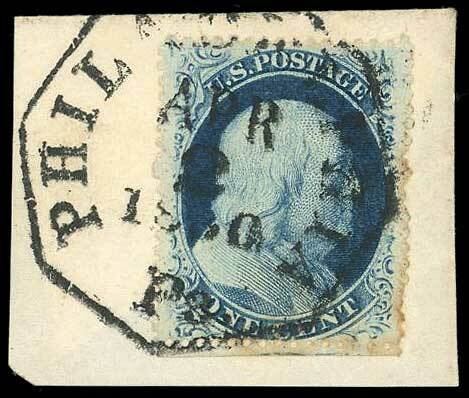 United States, 1857, 1¢ Blue, Type IIIa, #22, Tied on piece by neat Philadelphia octagon cancel, slight soiling around perfs, Fine. 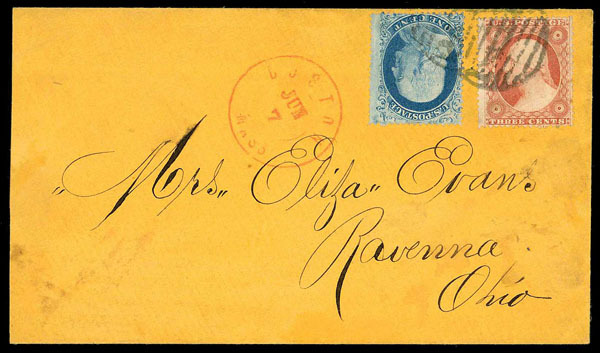 United States, 1857, 1¢, Type IIIa on 1857 South Bend, IN to San Francisco, CA Cover, #22, 24, pos. 78L4 and with #24 Type Va (pos. 77L5) tied by South Bend, IN cds; tiny part of flap at back missing and cover reduced at bottom, otherwise Fine to Very Fine. 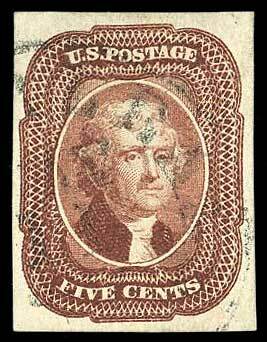 United States, 1857, 3¢ Rose, Type II, All 3 Plates, #25A, pos. 97L2L, black cds, fine, pos. 36R3, black cds, "oxidized ink, UL corner crease", f.v.f. centering, pos. 68R5L "1857 claret shade", blue cds, Fine or better, 2016-2017 A.P.E.X. certs. 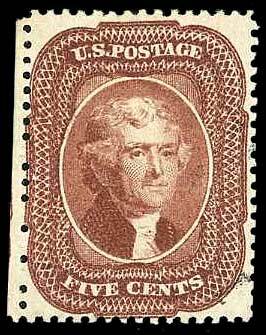 United States, 1858, 5¢ Brick Red, Type I, #27, face free cancel, "short perf at the left", Very Good to Fine, 2019 P.F. cert. Grade 60. 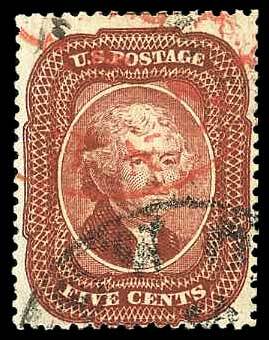 United States, 1857, 5¢ Red Brown, Type I, #28, barely canceled, strong color, "reperforated at the right", marginal, Fine appearing, 2017 P.S.E. cert. United States, 1858, 5¢ Indian Red, Type I, #28A, red and black cancels, "reperforated at the left", Fine to Very Fine appearance, 2017 P.S.E. cert. 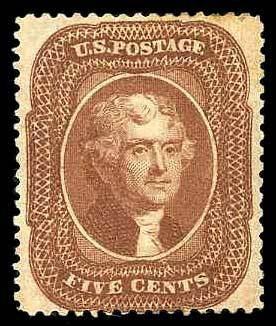 United States, 1861, 5¢ Orange Brown, Type II, #30, o.g., "light toning at the top right and reperforated at the right", Fine appearance, 2017 P.S.E. cert. 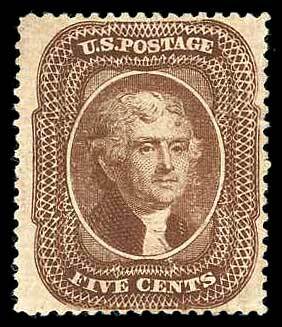 United States, 1860, 5¢ Brown, Type II, #30A, unused, Fine to Very Fine, 1969 P.F. cert.